Vision Research Corporation is the only single-source provider of large-scale eye screening services in the country. To date, VRC has provided eye screenings for over 6,000,000 children in public schools, private schools, daycare centers, and other locations with groups of young children. These programs are typically conducted throughout entire geographic areas, ranging from counties to entire states. Our programs are not “just a screening”. 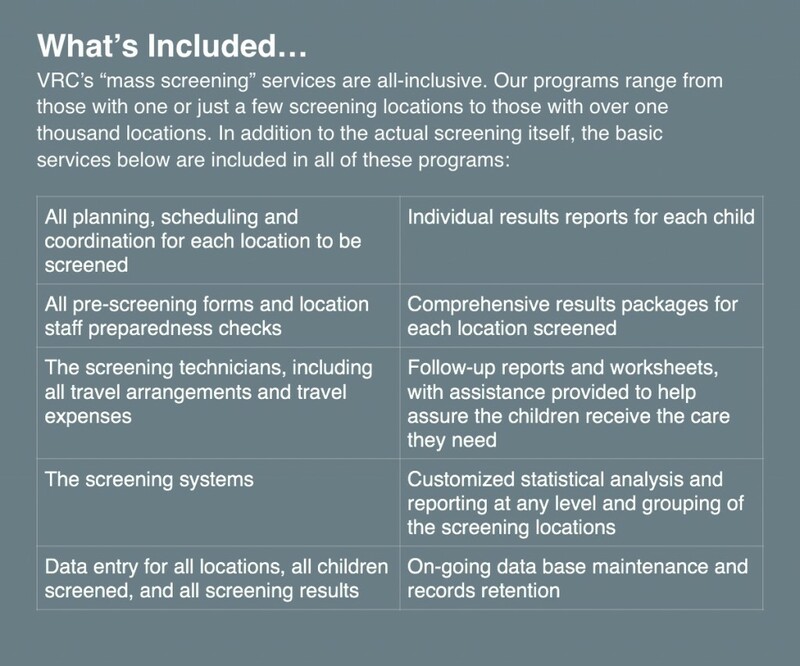 They are a complete solution, including all of the planning, preparations and scheduling in addition to the actual screenings, extensive results reporting, and follow-up reports and aids. Additional reporting and statistical analysis is also provided at all desired levels (school / center, system, county, district, region and state, for example). The key goals of our vision screening programs are to minimize classroom and academic problems resulting from poor vision, to identify the children who need to be seen by an eye care professional, and to help assure they receive the examinations and treatment they need.